Fastest mile my Garmin has ever recorded! I stayed on the grass this lunch time for my 5mile run. It was a bit wet and slippy underfoot in some places but definitely easier on my foot. Instead of doing 1.56mile loop three times I decided to extend my loop to just over 2miles which I did twice, then added another mile or so to make it over 5miles. I’m afraid the title of this post hasn’t anything to do with my run! I certainly didn’t run fast. On the way home yesterday I was wondering how accurate my speedo is on my Faser motorbike and remembered that Tim had said that his tom tom recorded a more accurate speed that his car instruments. 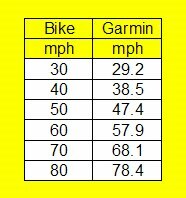 So I was wondering whether my garmin would record my speed more accurately. This morning and evening I strapped my garmin watch on to the handlebars of my motorbike and tried it out. Here is my little experiment …. The thing is I don’t know which one is the more accurate??? Anyway here is my journey to work. (I came home via the M8 motorway so I could try my experiment – just in case you thought I went 80mph on the Road past the Hurlet) …. It was fun seeing my average mile pace hovering around 2min miles for the 6mile journey. 5 Responses to Fastest mile my Garmin has ever recorded! My FB friend in the Traffic Dept was just talking about the fool o he bike doing 80 on the Hurlet! Is 80mph legal on the motorway now? reckon the garmin would be more accurate. surely the speedo is only an indicator and set slightly high to discourage speeding. Speedometers can be + or – 10% inaccurate so tolerance in a 60 mile per hour is to 66mph. After that the fine gets steeper!